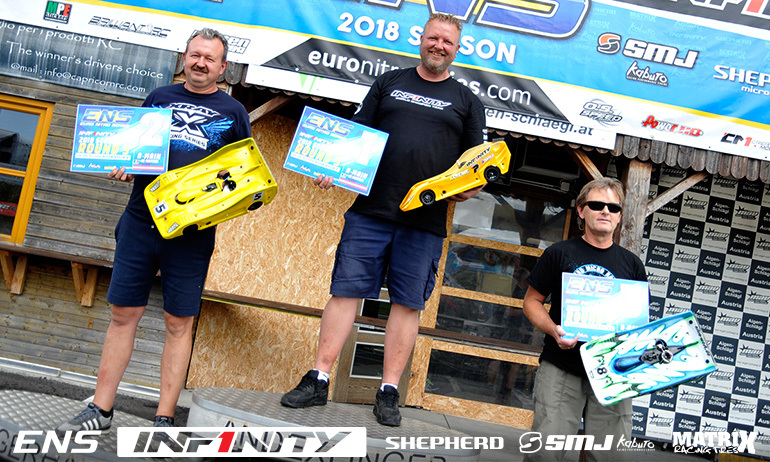 Simon Kurzbuch has taken his first win of the 2018 Infinity Euro Nitro Series in Austria. 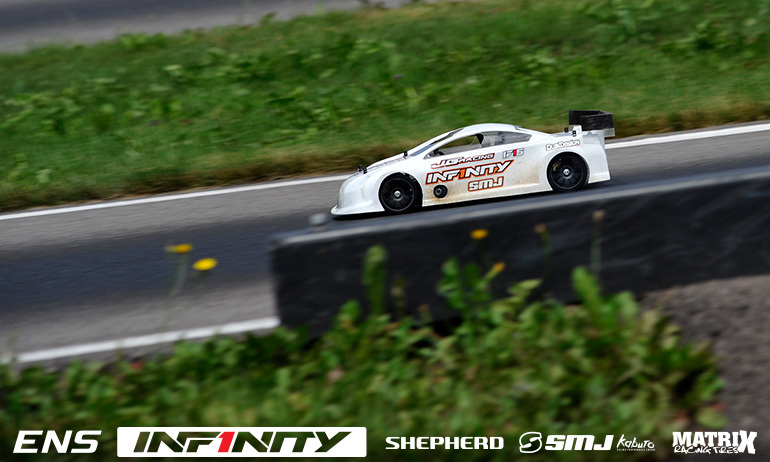 Coming into the weekend with three consecutive ENS wins at the Aigen track, the Shepherd driver continued to add to that tally adding his 10th ENS career win. Capping off the perfect win having TQ’d all four rounds of qualifying, today’s result means the title goes down to the final round in Fiorano in September. In contrast to the reigning champions successful weekend, for his main title rival & points leader coming into the event it was a 10th place DNF for Dario Balestri. 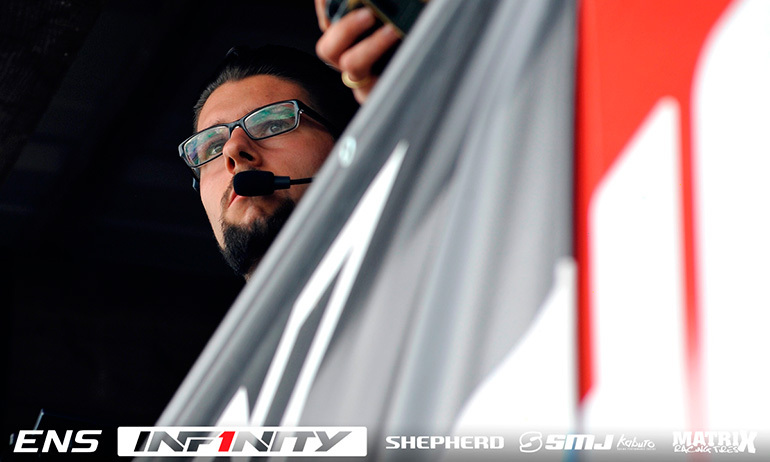 Starting 3rd, the Infinity driver suffered an early flame out but on his recovery drive he would later clash with Silvio Hachler with his car suffering damage that would end his race. Pushing Kurzbuch in the first half of the race, Toni Gruber would finish 2nd with Merlin Depta taking advantage of others issue to secure the final podium placing ahead of Lars Hoppe. ‘It was a good final from our side. We made no mistakes’, was how Kurzbuch summed up today’s vital win. The Swiss ace continued, ‘we ran a different strategy to the rest. On my second stop we changed the outside tyres so all the time I would have enough tyres to push if needed. This strategy also meant I could push for the stint before we did our full tyre stop’. Having been robbed of victory due to engine stops in the opening two rounds of the championship, the 2015 World Champion dedicated the win to those involved in the development of the new engine. 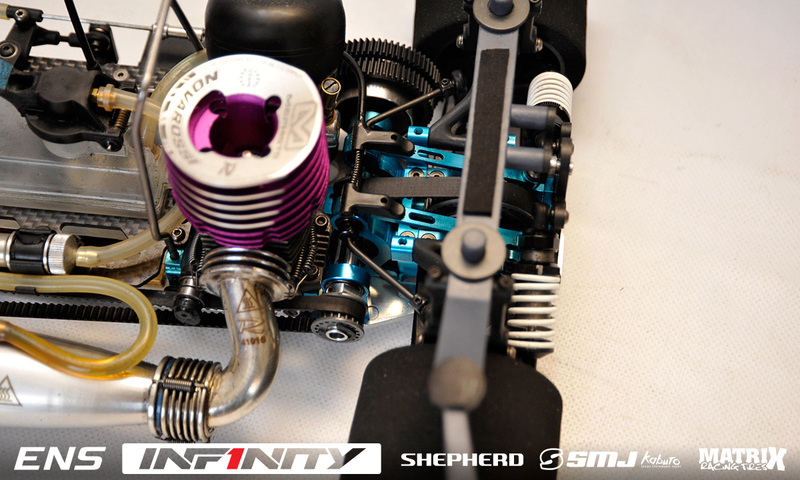 He said, ‘the engine was very good and this is the new Mephisto line’s first win. Daniele (Ielasi) and the guys at Novarossi have worked really hard for this’. He added, ‘My pit crew did a perfect job and now we have one more race to go. 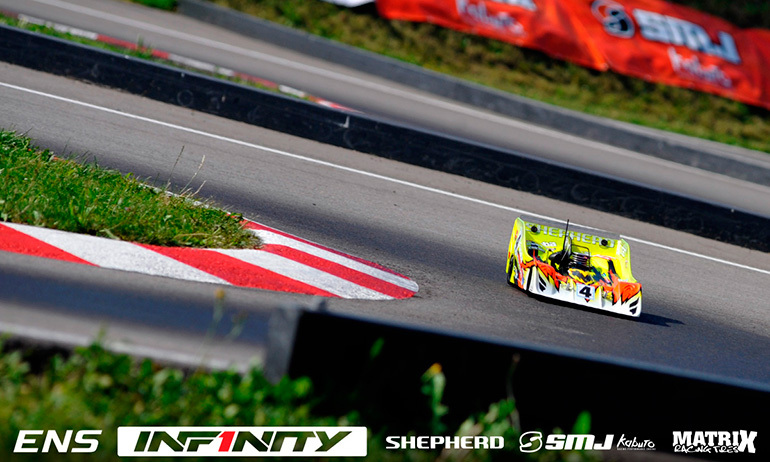 We knew what we had to do, take the TQ and win in Aigen, and now we have to do the same in Fiorano’. ‘Finally a second place. I start 2nd and finished 2nd so I am happy’, said Gruber after the 45-minute final. The WRC driver went on, ‘the car was really good at the start. I picked the best of the two sets of tyres we ran in the warm-up to start the race and they were really good. I could really push. After the tyre change the car felt difficult to drive and I think it was a tyre problem. I knew it was not possible then to pass Simon so then I drive easy to save my second position and bring it home’. 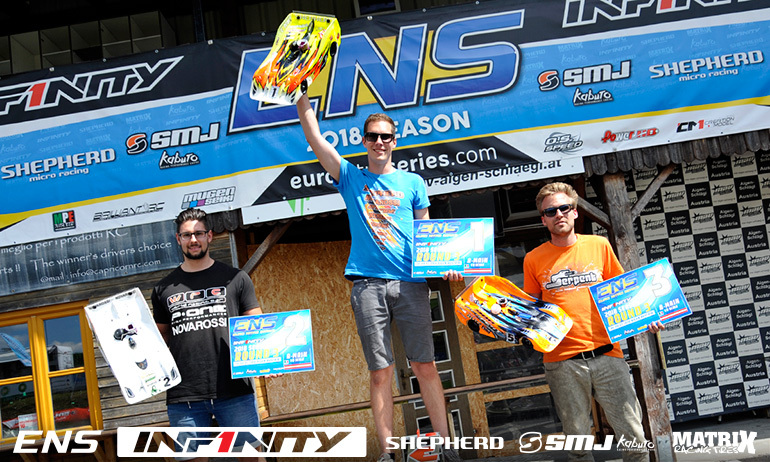 Missing the opening round due to his wedding, Gruber opened his campaign with a 3rd in Ettlingen and now a 2nd with an ENS win still eluding him. He said, ‘get a win is on my mind but my goal is to finish on the overall podium (3 of the 4 rounds counting in the final standing). Fiorano is a good track for me so I will drive as fast as I can and hope for at least a podium’. Claiming his first ever ENS podium finish, Depta said, ‘I took advantage of the casualties. Robert (Pietsch) and Dario had better pace but they were not there at the end’. The Serpent driver continued, ‘I had a good battle with Silvio and Lars but Dominic (Greiner) was just telling me to safe fuel. It was super close. Every stint was different. He was telling me push, don’t push but in the end it paid off’. ‘A little unlucky’ was how Hoppe summed up just missing out on the podium. The Shepherd driver and a former podium finisher in Aigen, he said, ‘until the tyre change all was perfect. I was 3rd and had an easy gap over 4th but in the stop a shock came out at the top. I had to drive one lap on three shocks and then they fixed it. 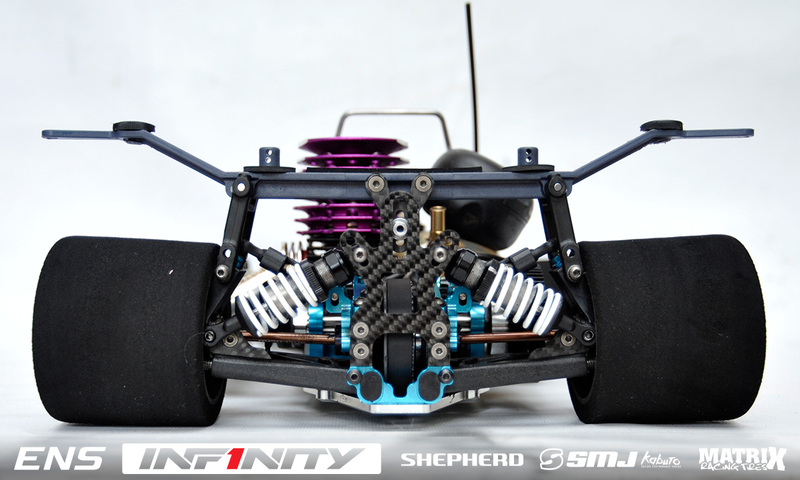 After that I had some engine tuning issues and the engine was too rich’. The German concluded, ‘P4 was good but more was possible today’. In the 40+ class, the ENS crowned its first 2018 Champion as Arie Manten completed his third consecutive perfect weekend. 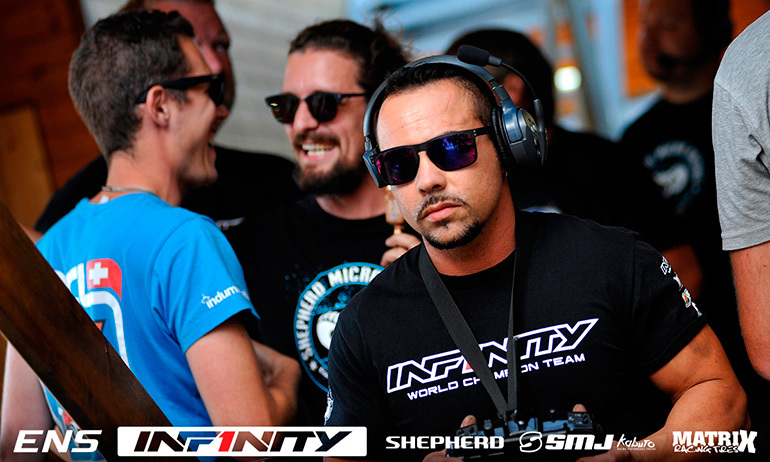 Starting from the TQ, the Infinity driver had an easy win over Tono Sloboda and is now uncatchable in the championship standings. 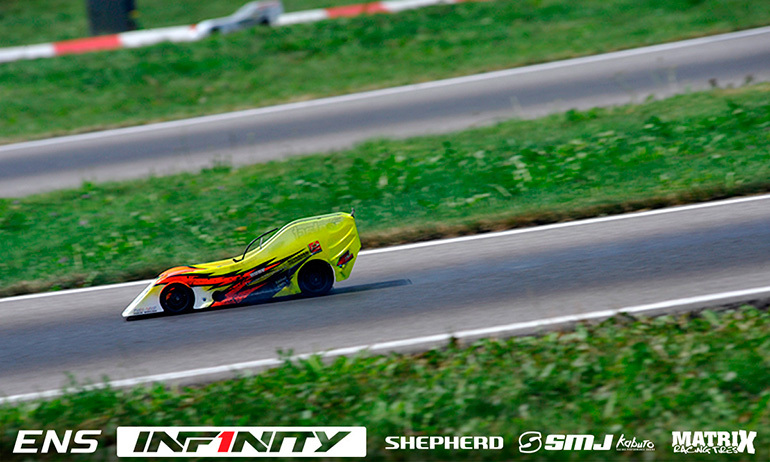 Jilles Groskamp lead home an Infinity 1-2 at the third round of the Euro Nitro Series in Austria today. Starting from 4th on the grid, the Dutch driver would win the 45-minute encounter from team-mate Francesco Tironi, benefiting from engine troubles that would strike both Top Qualifier Dominic Greiner and Eric Dankel. Taking early control of the race, Greiner looked destined for his second win of the season with his team executing a perfect tyre stop but as the Serpent driver rejoined the track his engine cut in the sweeper. Brought back to the pit lane, it fired up immediately, but again in the sweeper it stopped but again it was fired up without hesitation and third time lucky it kept going for the remainder of the race but it cost the dominant German any chance of the win. The only driver to really take the fight to Greiner today, Dankel’s race started to come undone when he made contact with Alessio Mazzeo who was exiting the pits but in the end the Mugen driver’s frustration would only get worse with a flame out, contact with a backmarker and finally a broken engine. 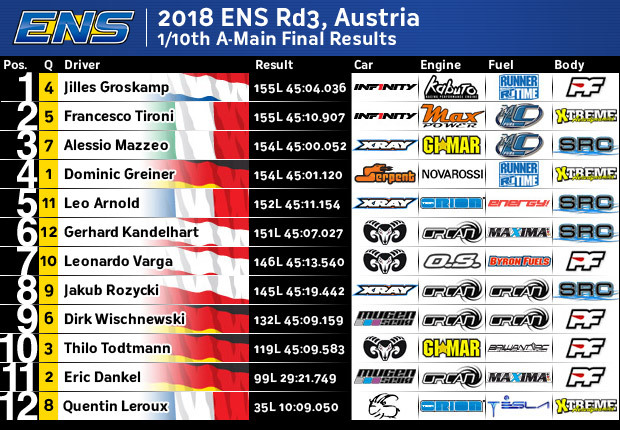 All the while Groskamp was having a steady race even overcoming a slow tyre stop to take his 2nd ENS career win ahead of Tironi with Mazzeo hanging on to complete the podium ahead of Greiner. ‘I had the pace for the podium but not the win today but we ran super safe and others had problems’, was how Groskamp summed up his win. The former champion continued, ‘we started with a rich engine and it never got up to temperature which cost me some time and again my arm went numb which was the same problem I had in Holland and which is something I need to get checked but we went with a safe strategy, 5-minute fuelling, all four tyres. The tyre stop went wrong and we lost a nut but it didn’t matter because the others hit trouble. We went safe, the others were on the limit and our approach paid off today’. Extending his championship lead ahead of the season finale in Fiorano, with Greinier needing a dominant qualifying and race to deny him the title, he concluded, ‘we have to improve for sure. The car needs to be better but I’m happy with today’s result’. Summing up his race, having started 5th behind Groskamp, Tironi said, ‘In the beginning I think we lose the race but from 5th you have to try to overtake, sometimes it works, sometimes not. I make a little crash and I have to wait to give back the position and lose a lot of time’. The incident he was referring to was his contact with Shepherd’s Thilo Todtmann who having started 3rd ended up in the grass at the end of the straight following the contact. A former Top Qualifier of the Aigen race, the Italian went on, ‘the car was good so I was able to push. Everything in the pits was really good and we also were a little lucky but we were always competitive for a podium today. 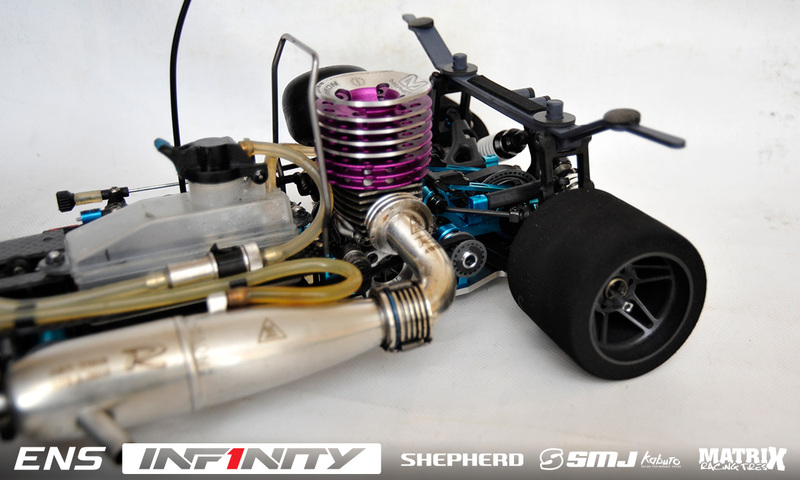 To be part of an Infinity 1-2 feels good’. ‘Tired’ was Mazzeo reaction after the 45-minute encounter. 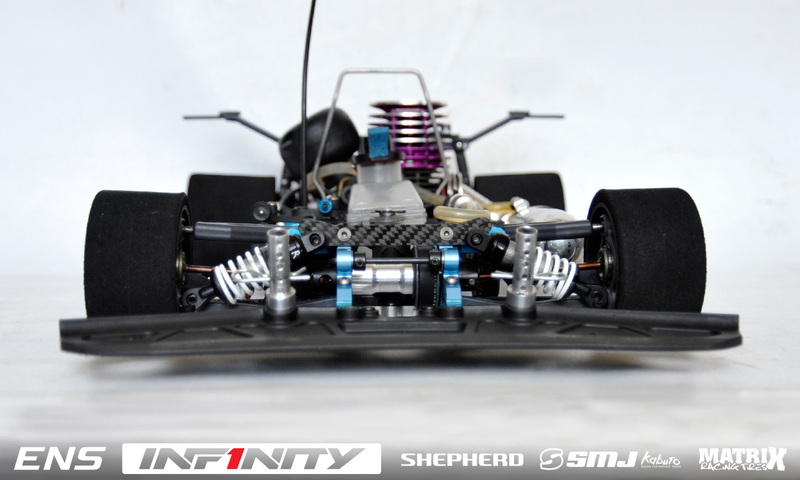 The Xray driver said, ‘In the morning (A-Main practice) the car was super fast but to try improve the steering under braking we changed the diff for the final and it was undriveable’. 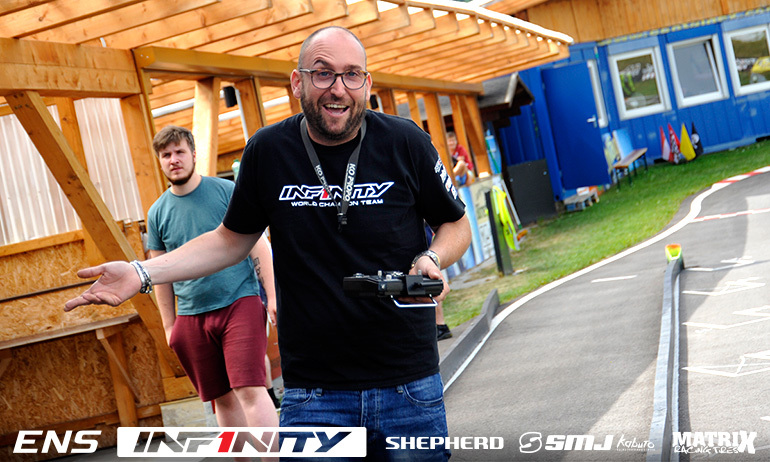 The Round 1 Top Qualifier continued, ‘I had a quiet race and some luck came to me as Dominic and Eric went out which out me second but the magnetism went in the nut spinner and we lost a nut in the tyre stop which cost me 20-seconds’. With Greiner closing in the final laps of the race, he said, ‘I was never under much pressure as I knew the gap was too big. The big problem today was the bad choice of the diff. For sure the podium is always good but I am not satisfied with the race but as you see Dominic was fastest all weekend and finished 4th, that is racing. Congrats to Jilles for the win. We will keep fighting for Fiorano’. ‘Like most of the time, unbelievable’, was how a bemused Greiner summed up his problems. 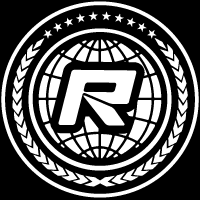 The World Champion continued, ‘we changed tyres perfect but then on full throttle it flamed out, it fired up again, then again on full throttle it stopped again. We changed nothing and started it again and it ran perfect for the rest of the race. I don’t know what caused this’. With some of his rivals expected to take risky strategies for the race in order to try in somewhat make up speed deficit to Greiner, it was him who would actually break from the norm. He said, ‘We went 5:40 because we thought maybe Jilles make but we only did it for the first one once we saw everything was going 5 and we had a good lead. The 5:40 then meant we had an empty pitlane for the rest of our 5-minute stops’. Clearly annoyed with Mazzeo, telling the him he ‘maybe needs glasses’, to which the Italian replied, ‘I just stayed on my line’, Dankel said Mazzeo’s actions destroyed his race. Closest to Greiner in terms of outright pace, the German said, ‘I had a chance for the win before Mazzeo hit me but in the end the engine broke’. 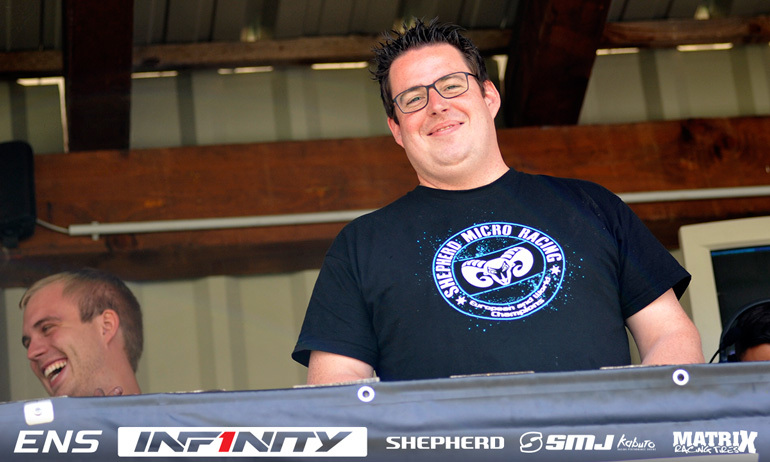 Remarks – Taking his third TQ of the season here in Aigen, Simon’s remarks on his super fast Shepherd were very simple ‘it is the same as before’. 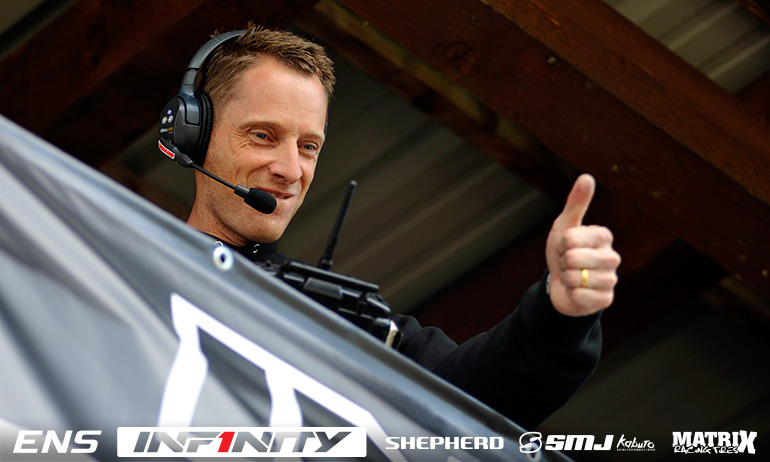 Simon Kurzbuch is Top Qualifier for tomorrow’s penultimate round of the Infinity Euro Nitro Series in Aigen. 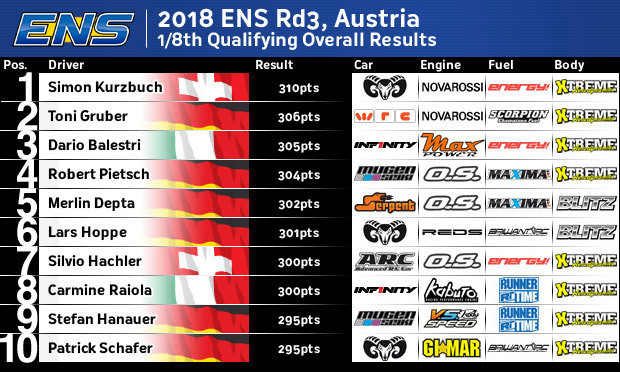 The reigning champion claimed his 3rd consecutive pole position at the Austrian track with a dominant qualifying performance topping all four rounds of qualifying. 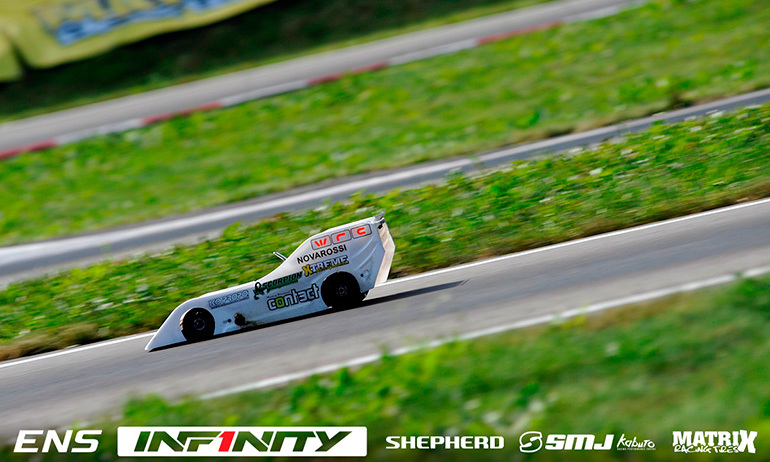 His third TQ of the season which is so far void of a victory, the Shepherd driver will lead away the 45-minute final ahead of Toni Gruber and championship leader Dario Balestri. Gruber secured his best qualifying of the season by backing up his his Q1 performance with another P2 time in the final qualifier allowing him to overhaul Balestri on the grid. 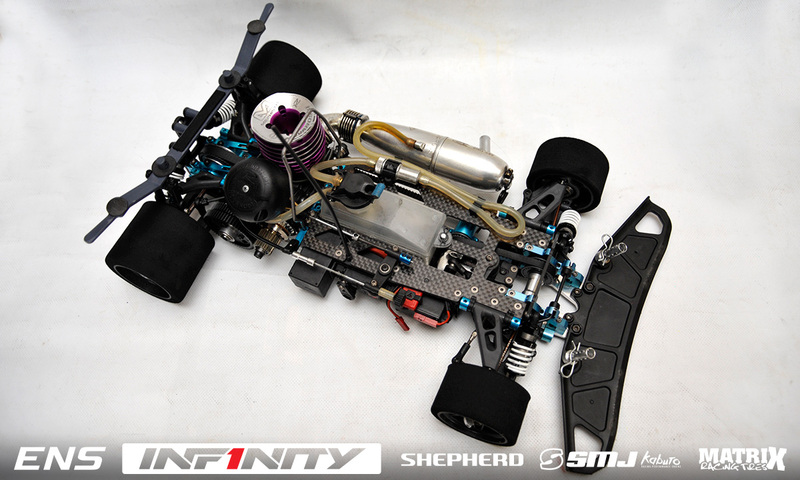 Q4 would see Balestri unable to battle to maintain his position due to a rich engine. 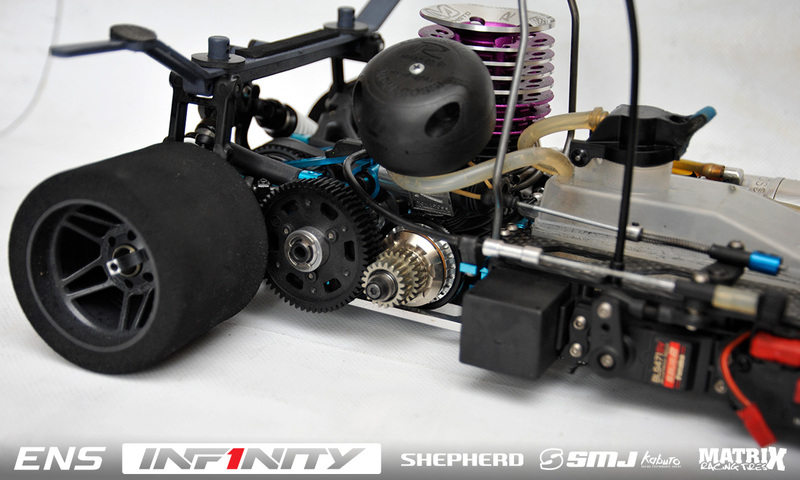 A former Top Qualifier of the race, Robert Pietsch will start 4th with Serpent’s Merlin Depta making it five different manufacturers at the front of the grid. ‘It was a very good day. 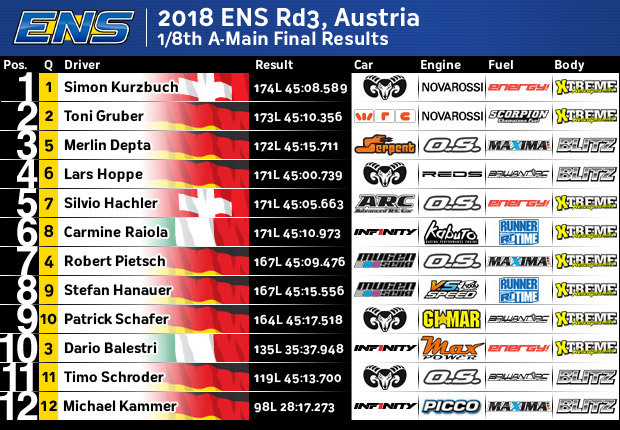 All the testing paid off and we are where we want to be’, was Kurzbuch’s reaction to his 11th ENS career TQ. 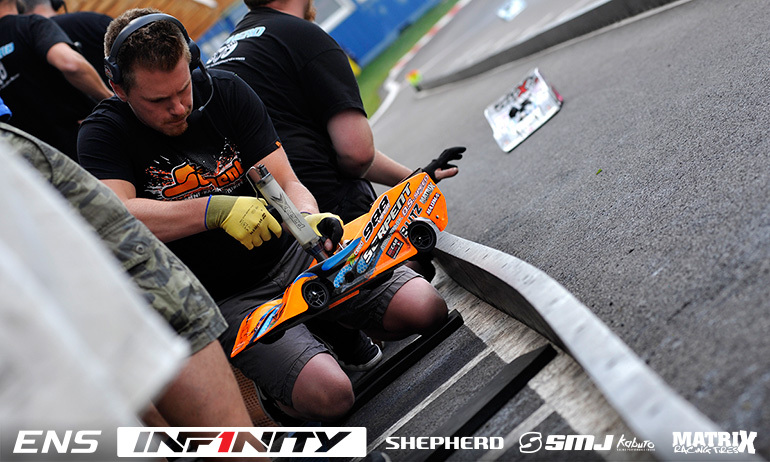 The 2015 World Champion added, ‘we needed this TQ if we wanted to have a chance at retaining the title and we need to do better in the final that at the last two races but we have had good finals recently and I hope we can get the result we are after’. Looking in control of proceedings, asked about tomorrow’s final he said, ‘It is quite important we have a good tyre strategy. It’s not really a high wear track but we still need to double check that we don’t run out of tyres at the end of the final. Especially because if the long sweeper where it will be important to manage the tyres’. 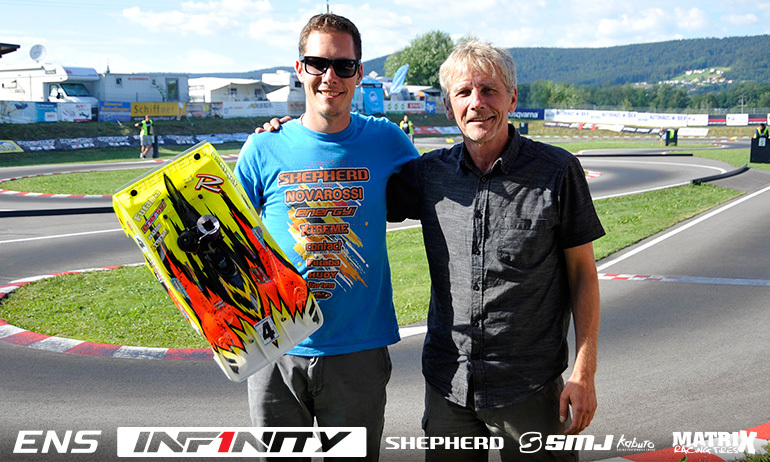 Summing up his day, managing to qualify one place higher than he did in Ettlingen, Gruber said, ‘In the end I am happy. The car did a good job and the gap to Simon is close just he was more consistent than me’. With the fastest lap of both Q1 & 4, when he was second fastest behind Kurzbuch, the WRC driver continued, ‘I hope the track is the same tomorrow as today because the balance of the car was really good. 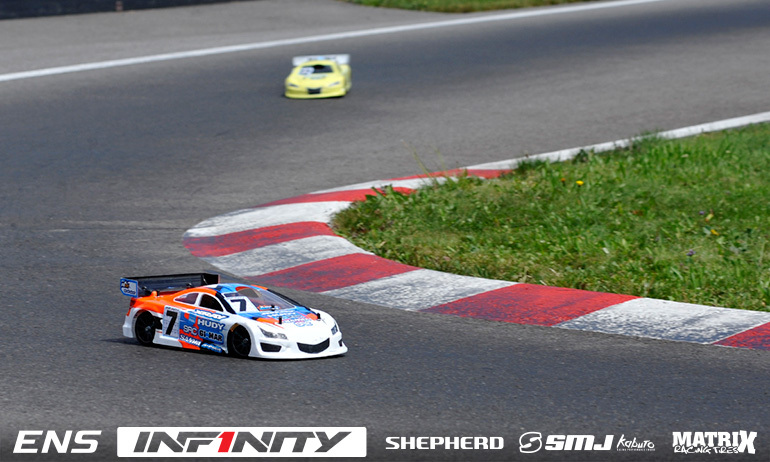 The first race (Ettlingen) we qualified 3rd and now we start 2nd so I’m positive going into the final tomorrow’. ‘A trouble day’ was how Balestri described qualifying. 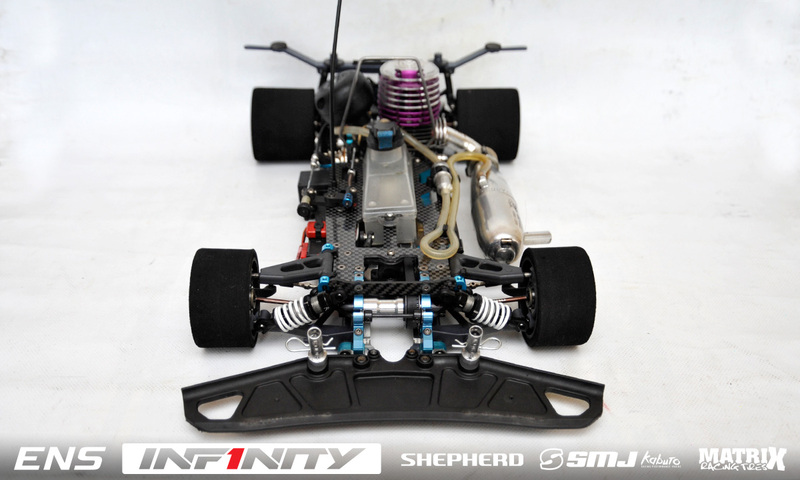 Suffering a glowplug failure in Q2, the Infinity driver continued, ‘Q3 I was on a good run but the engine was too lean and I had to back off to get some points and in the last one the engine was too rich. Anyway 3rd is still a good position’. 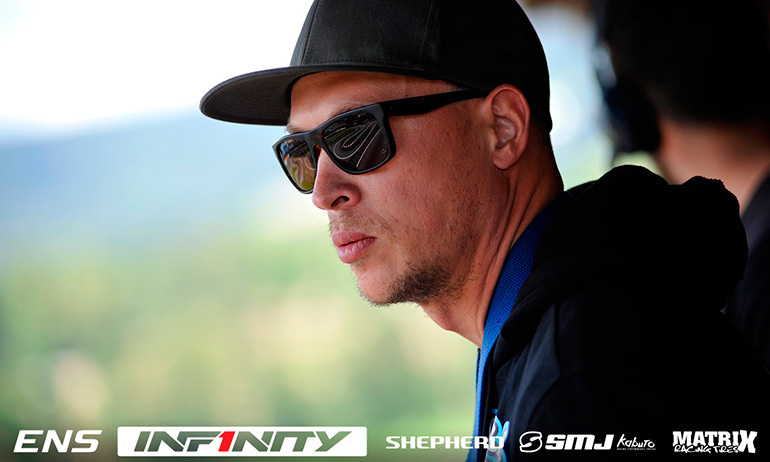 Chasing his second ENS win for Infinity, having given them their first 1:8 ENS win at the previous round, he concluded, ‘we have good pace and the car is stable and easy to drive so I will try to follow him’ – him being Kurzbuch. 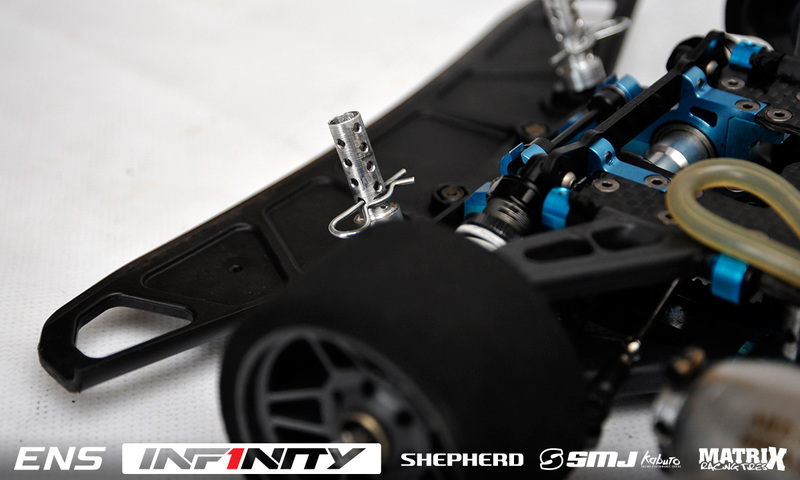 Pietsch said, ‘the car now is OK. The last one the engine was a little lean and I lost a little power which cost me’. 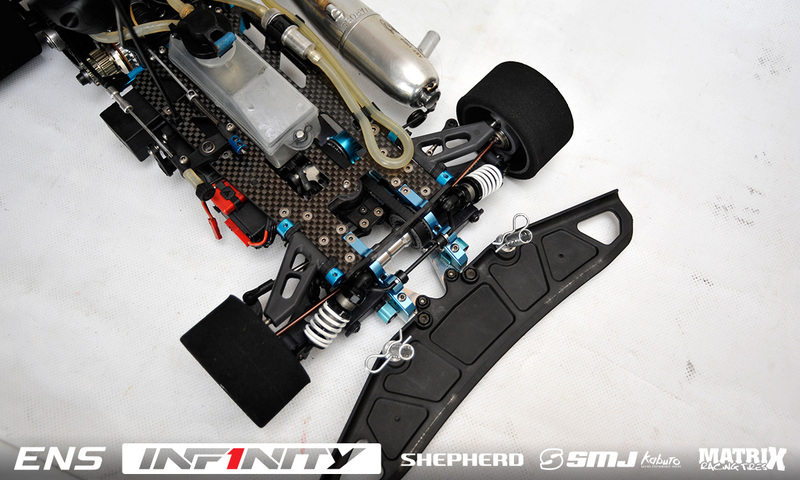 Asked how he improved that he replied, ‘we ran a completely different set-up’. On the final the Mugen designer feels he might be able to get an edge on his rivals saying, ‘maybe on the fuel strategy I can do something different to the others’, adding ‘tyre are not a big issue’. 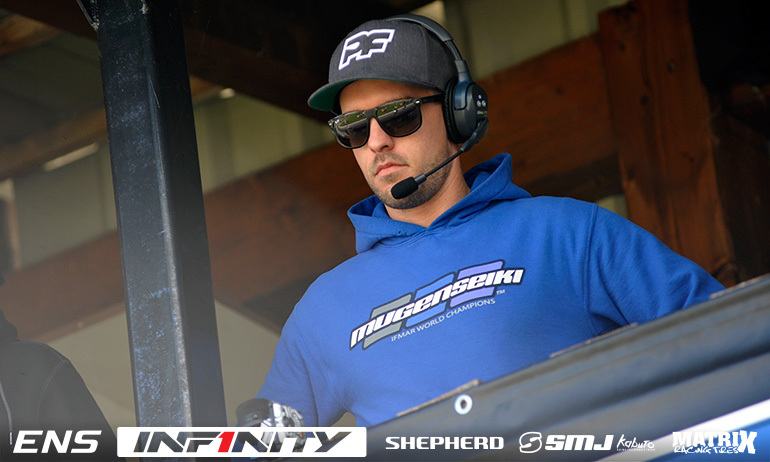 In the 40+ class, Arie Manten continued his reign over the championship claiming his third overall TQ of the season putting him in pole position to become the inaugural champion tomorrow. Andrea Hächler, father of ARC team driver Silvio, will start second with the Xray of Igor Liptak completing the Top 3 on the grid.